The Ducks' basketball teams were looking to sweep Stanford on Sunday, as the women won 88-48 earlier in Palo Alto. The men's game started slow, but it was exciting at the same time. Kenny Wooten was the star of the first half, as he recorded 4 points, 5 rebounds and 5 blocks. Each swatted shot was more powerful than the last, but it wasn’t just Wooten who was a defensive force. Oregon as a team held the Cardinal to 23 percent shooting, limiting the visitors to 10 points in the paint. The Ducks started the game on a 16-2 run, as Stanford was 0-10 from the field. Oregon had a lot of key contributors in the first half. Four Ducks had 5 points, and two more had 4 points. The Ducks outrebounded Stanford 27-19 and held the Cardinal to just 2 points on the scoreboard for the longest time. While Payton Pritchard looked good in the first half, he exploded for 15 points in the second. The junior guard was aggressive, driving to the rim and totally confident in his moves. Pritchard was a perfect 6-6 from the field in the second half, adding 2-2 from the free throw line. Alongside him was Lou King, who finished with 12 points and 5 rebounds on 4-5 shooting. King was held to 4 points in the first half, when he seemed tentative off the ball and often settled for long jumpers. But in the after intermission he was off in transition and looking for easy buckets. King continued his near streak of scoring in double digits in 10 of 11 Pac-12 games, and his untapped potential is beginning to surface consistently. Another positive force was Victor Bailey Jr., who finished with 11 points, including 6 in the second half. Bailey has been struggling from the field recently, but he finally got going Sunday. 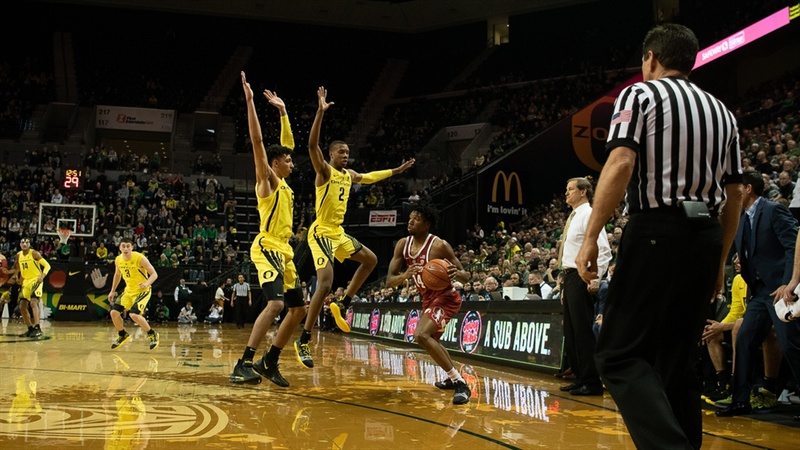 Stanford shot a little better in the second half (33 percent) but still failed to make any impact on the offensive end as Oregon padded its lead relentlessly. Oregon turned the ball over just 9 times, compared to Stanford's 14. Stanford finished with just 3 assists and shot just 27 percent from the floor and 17 percent from behind the three-point line. Oregon was abysmal from the free throw line, going just 10-17. Wooten tied his career high in rejections, recording 7 blocks in just 26 minutes. Oregon held Stanford’s leading scorer, KZ Okpala, to just 10 points on 3-14 shooting.